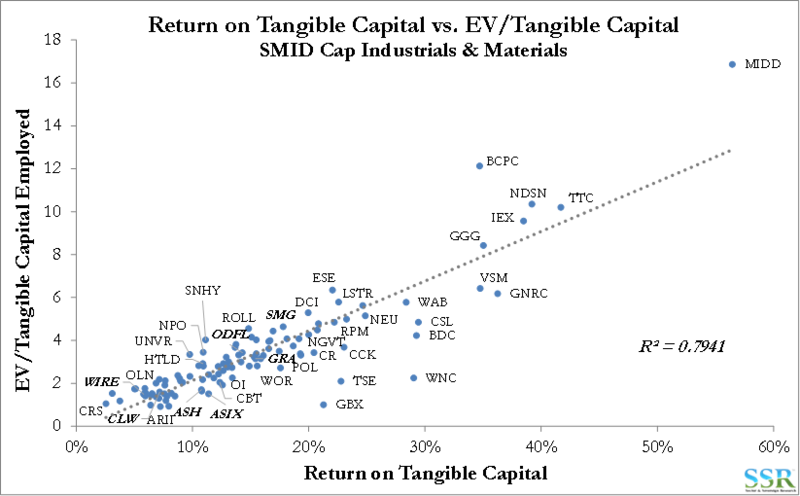 In the larger-cap universe there are already several “fundamental” or “directional” paths reflected in certain stocks in the Industrials and Materials universe. Most companies highly leveraged to an uptick US infrastructure spending are already discounting prior peak earnings or better. There have been rallies in stocks and sectors which have been plagued by high levels of cheap Chinese imports – in part because of reduction in Chinese material in the second half of 2016 but mostly because there is an expectation that the new administration will be harder on Chinese “dumping” than the prior administration. President-Elect Trump is going to propose a lot of changes and investors are going to have to come up with a set of assumptions around which of those ideas are likely to come to fruition and in what timeframe. 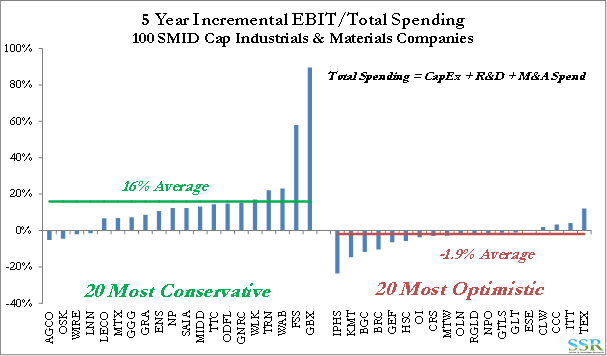 In this SMID cap piece we focus on exposure – in an attempt to identify stocks that could benefit from any number of tacks that policy might take over the next year and have the valuation support to look like reasonable investment ideas. We provide all the factors that we have considered for all 100+ stocks so that clients can prioritize as they see fit. At the other end of the scale we look at stocks that are already pricing in too much – i.e. more positive impetus than their business mix and fundamental drivers justify. We do not use our comprehensive “normal value” framework for most of the companies include in this analysis because many do not have the history to construct the model or do not have an obvious proxy. As a measure of value we look at free cash flow and valuation versus return on tangible capital (ROTC) – Exhibits 2 and 3. While like some of the fundamentals behind a few of the cheaper companies here, such as VSM and TSE, they do not make the cut on this analysis because they have too much of their sales base outside of the US and are vulnerable both to trade policies and a strengthening dollar. Fundamentals and strategic actions may overcome the headwinds for both, but they do not tick enough boxes to make the cut in this piece. On the opposite side of the fence we list companies with more limited US sales and that have little in their business mix which would benefit from the three factors above – Exhibit 4. The top 20 US focused SMID names all generate at least 90% of sales domestically. Trucking names predictably dominate the top of the list. WIRE, an intriguing electrical wire and cable company (BGC competitor), also has a strictly US sales base but a prohibitively low average daily trading volume. Clearly any “protectionist” policies will see those with predominantly more US centric portfolios much more levered and less concerned about the possible strength of the dollar. The assumption here is that Trump will try to cut US corporate taxes and that those with the highest effective rates – often those with the highest concentration of US sales will see the greatest benefit. We are using this measure as a sign of leverage – companies with high sales per employee often have the highest incremental operating leverage, benefitting the most from incremental sales. In addition, should Trump policies lead to inflation and wage rises, these companies are less exposed. LSTR’s sales per employee figure is likely inflated – its business model relies on what it terms “business capacity operators”, essentially independent agents that arrange transportation for clients, that are not included in the company’s technical employee count. This list is otherwise dominated by chemical producers, as you would expect. The potential repatriation of offshore cash holdings has received attention and there are a number of SMID caps with significant cash in foreign jurisdictions. In Exhibit 8 we have expressed the amount of offshore cash as a percentage of the company’s current market cap – equivalent to a special dividend or the potential reduction in share count if the repatriated funds were used to buy back stock. We assume a 15% repatriation tax. This is in part a momentum indicator, showing what stocks have run post-election in anticipation of gains derived from Trump policies. It is important to note here that there are likely no companies on any lists here likely to see direct earnings gains from anything the new Administration does before at the very best Q4 2017. Consequently, there is a risk that expectations get ahead of what is practical and we see some earnings misses before we see the gains. AYI and WOR are down on recent earnings – both have a significant US sales base (top 20 in the US sales rankings in Exhibit 5) and appear well positioned from a business mix perspective (commercial lighting for AYI; steel for WOR) to benefit from domestic infrastructure stimulus. LNN is also an earnings underperformer, and has an intriguing infrastructure business (movable barriers used in highway reconstruction) though its relative size in the portfolio (20% of sales) is dwarfed by the company’s agricultural irrigation business, and its geographic mix is only moderately slanted toward the US (63%). The worst performing paper & packaging stocks here all have greater foreign than domestic sales exposure, and CCK and OI have additional Mexico risk from recent acquisitions. The trucking companies did well in the immediate aftermath of the election, but have slumped since the OPEC output agreement in mid-December – higher crude on the margin favors rail transportation. 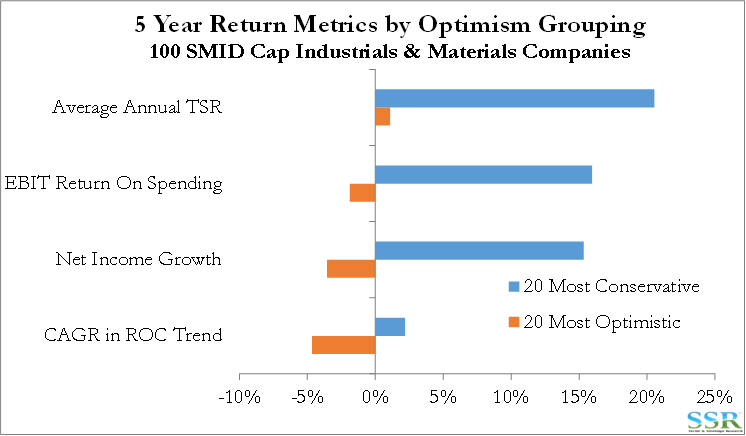 We often reference our work on corporate optimism as a complement in our process of identifying investment opportunities – simply put, those companies that habitually guide to realistic earnings expectations and subsequently over deliver not only predictably outperform, but have been shown to exhibit expanding returns on capital relative to their more overly-optimistic peers – they make better capital allocation decisions – Exhibit 10 shows the gap between the most conservative and the most optimistic. In the SMID space the results are exaggerated compared to the large cap group, where underperformers are more readily identified and held (sometimes forcefully) accountable. Exhibits 10 we show the most conservative companies in the group – those that have consistently over-delivered and the measure is by how much annual earnings have beaten expectations. 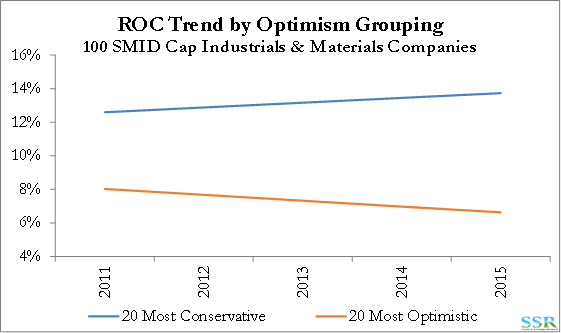 The measure is called “Optimism” but we are actually looking for the least optimistic companies and the indicator can be confusing in its labeling if you have not followed our work here – In Exhibit 11 WLK has most consistently overdelivered and by the most significant level. 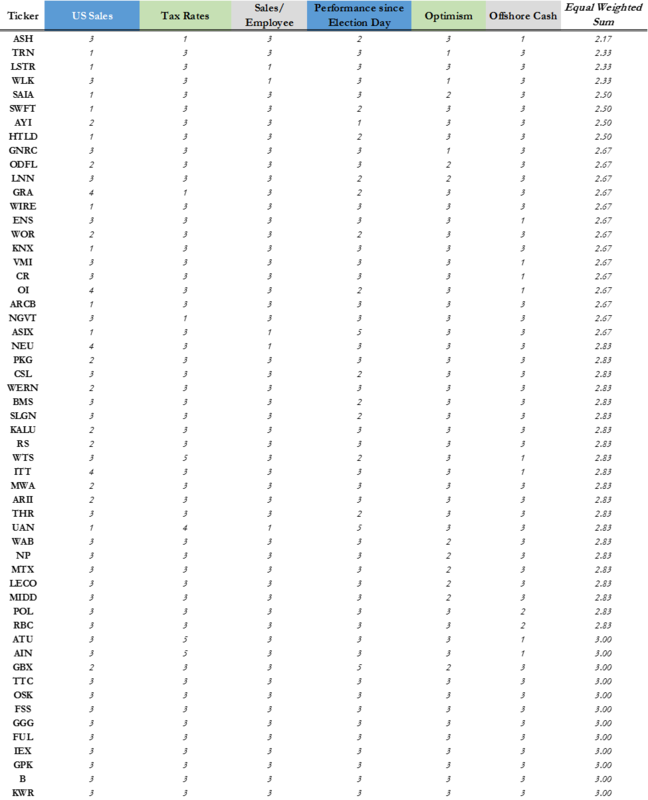 The table below uses the group averages and standard deviations to sort the stocks into five standardized ranges – 1 being the most attractive and 5 the least. Each measure is equally weighted and the quintile rankings are summed in the right hand column.